"Iowa nice" is really a thing. If you'd like to meet friendly, polite and easygoing people, please come to our state. ....just skip the parking lot at my children's elementary school. Car line is an adventure. One snowy morning, one of my Iowa nice boys snapped and shouted from the backseat at the long line of brake lights in front of us, "WHY ARE YOU DOUBLE PARKING?!? BECAUSE YOU HAVE TO DROP YOUR PRECIOUS CHILD OFF AT THE FRONT DOOR WE'RE ALL GOING TO BE LATE!!!" Thankfully, there was plenty of time to unpack that statement and calm down a bit before we got to a safe unloading spot. After I assured the boys that I thought they were both precious *and* capable, they got their hug and started the trudge to class. That morning was the start of a new family joke. I am now rated on how closely I can get them to the front door. Some mornings they call themselves 'precious.' Other mornings they are 'semi-precious.' It's a funny way to start the day with a smile, but it works! Hearing 'semi-precious' most mornings was the spark for me to make a series of jewel inspired quilts. 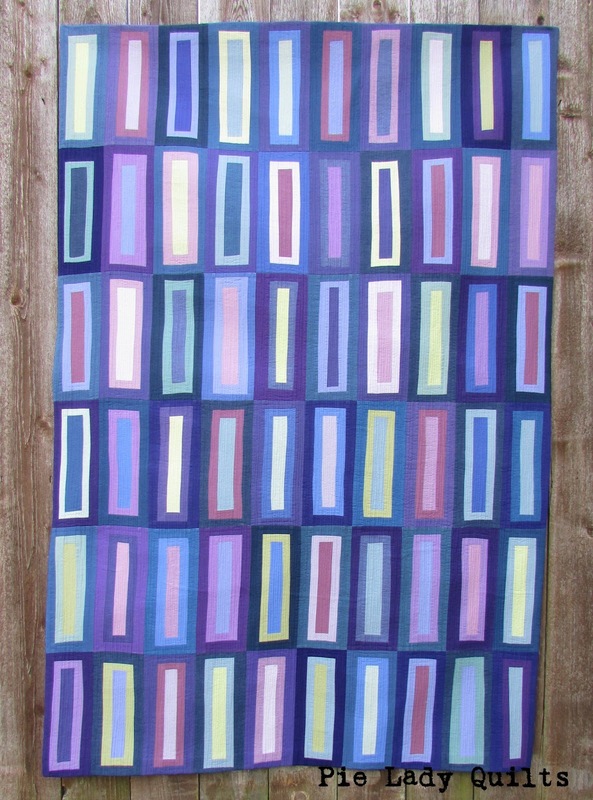 I always play along with the Pantone color of the year (ultraviolet), so I had the color inspiration to boot. 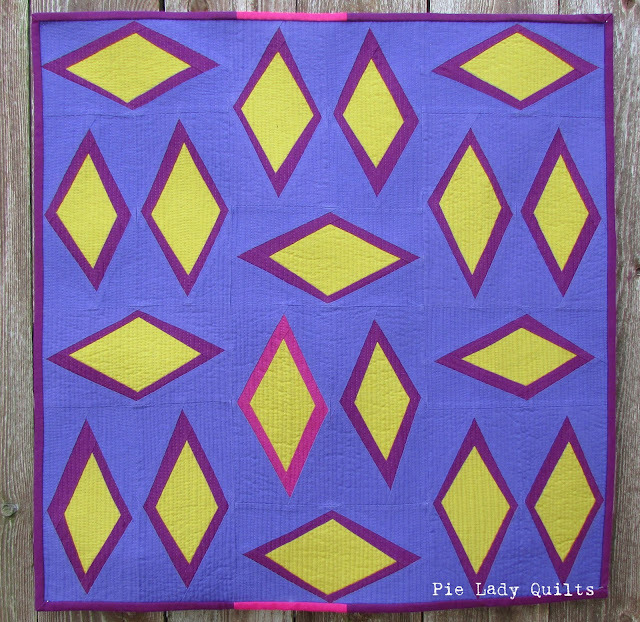 It was a new way of thinking about creating quilts when my mind was completely focused on shape and color. I had so much fun exploring both of them. The first is "Trillion Cut." This is an 18" square pillow that I made with ultraviolet in an analogous color scheme. 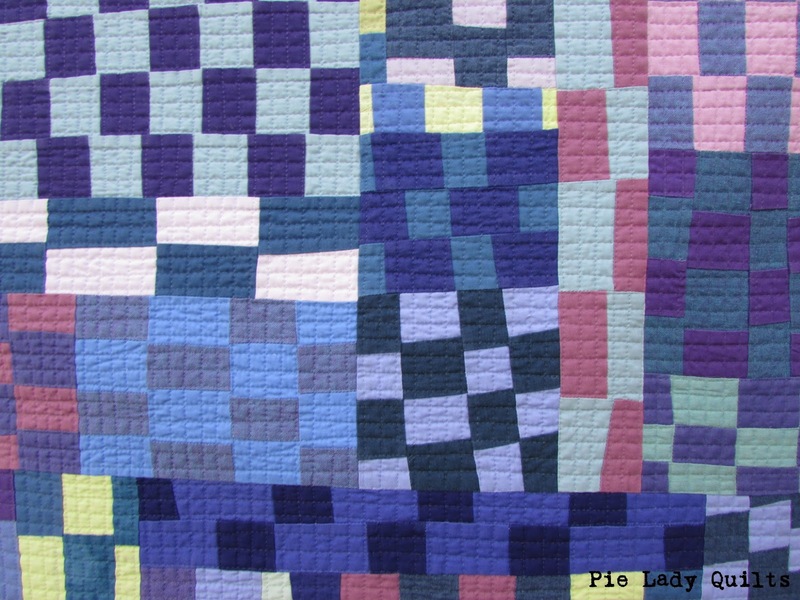 This is a miniaturized version of a quilt (Love at First Glow) that I made last year. I constructed it using improvisational piecing on top of paper triangle templates that I made. It is quilted with monofilament thread. Next is "Twilight Glitter Sparkles." This was named by my preschooler daughter in a combo that I'm pretty sure is a mashup of My Little Pony and Trolls. It is 48" x 69." This is just a quilt top for now. My sewing machine is in the shop and I've been sewing on my mom's old Pfaff for the last couple of months. It's a great little machine, but it just doesn't have the harp space to do a pivoting design on a bigger quilt. I'm still debating about whether I'll quilt it when I have my machine back or pay someone with a long arm to do it. 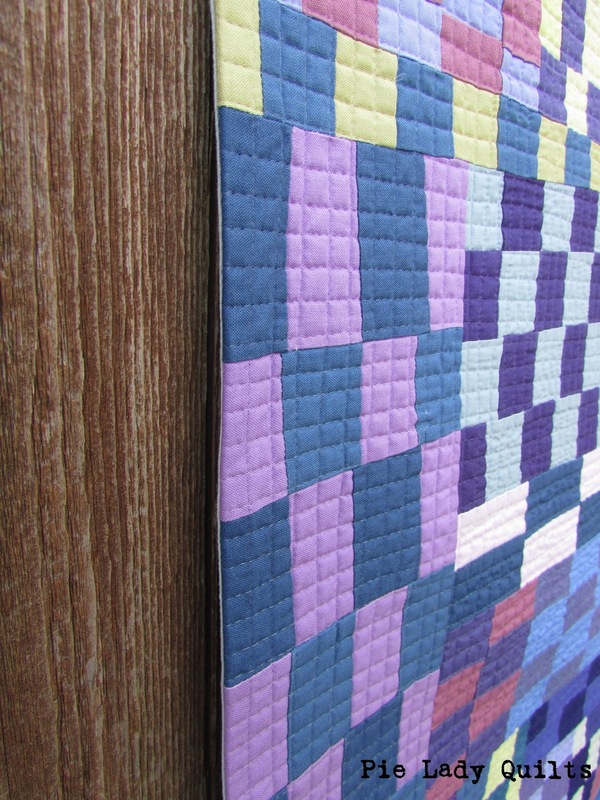 This quilt uses ultraviolet in an analogous color scheme as well. I free pieced the blocks in different sizes for variety. I challenged myself to come up with different friends for ultraviolet. I read about a square color scheme and decided to give it a try. 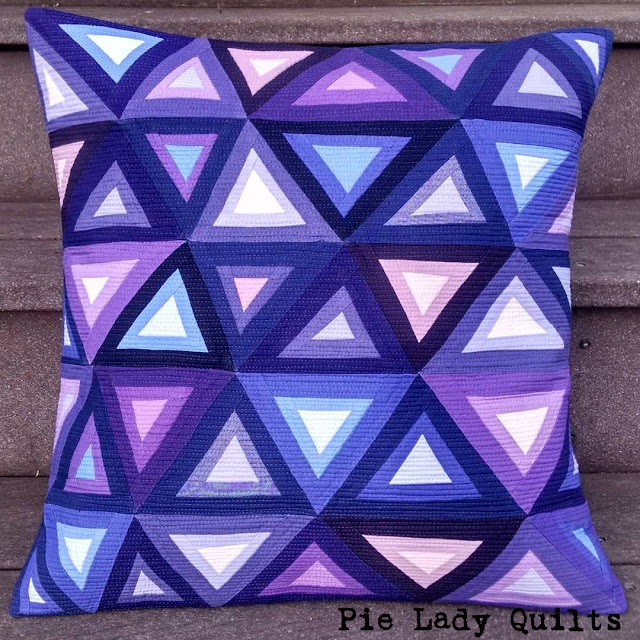 I used my color wheel to choose 4 main colors evenly spaced around in a square shape. I spent a long time with the color selection, looking carefully in different lights at different times of the day. 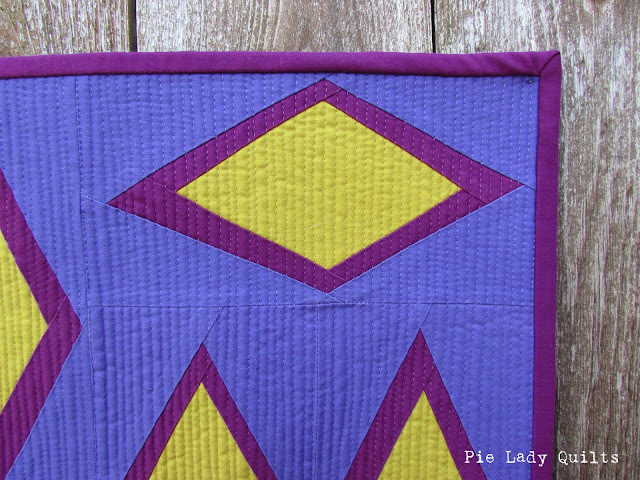 I am pleased with the result and that it still reads as a purple quilt. This is "Emerald Cut." It is 40" x 60" and is quilted with monofilament thread. The blocks are all free pieced, then squared down to a consistent size. 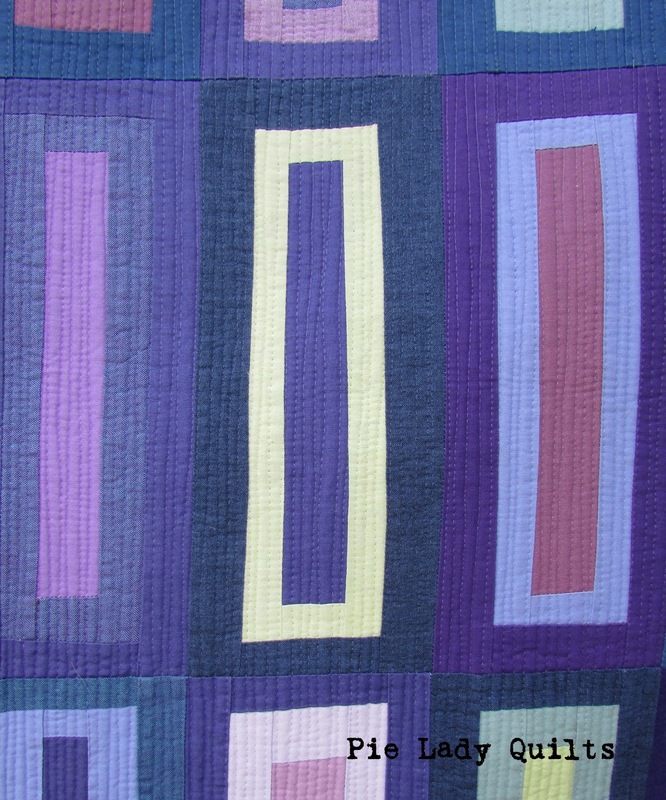 I had plenty of strips left over after piecing the last quilt. There's no time like the present to deal with coordinating scraps, so I sat down with the bucket and started sewing the strips together. This project used up most of the scraps I had generated in the last three quilts. 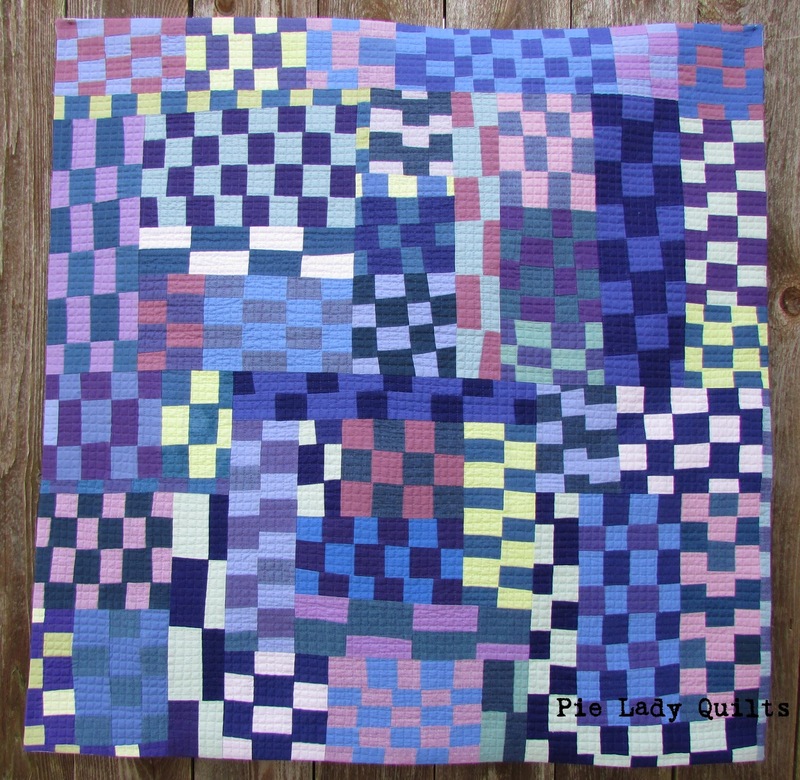 This is "Pixelated Scraps" and it is 31" x 31." I quilted it in a crosshatch pattern with monofilament thread and finished it with a faced edge. Last is "Diamond Split." 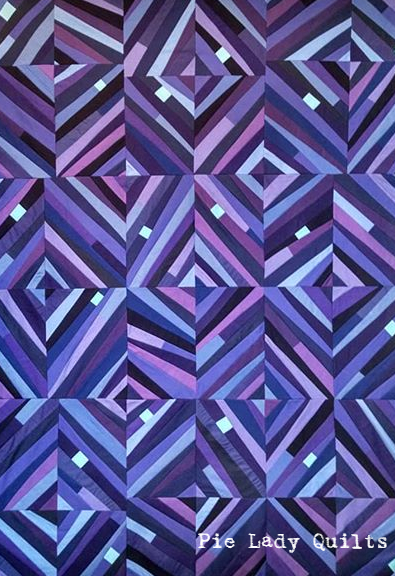 This is a small 24" x 24" quilt that I made with ultraviolet in a split complementary color scheme. The diamonds are improvisationally pieced. This used Kona bright periwinkle, cerise, wasabi and berry. 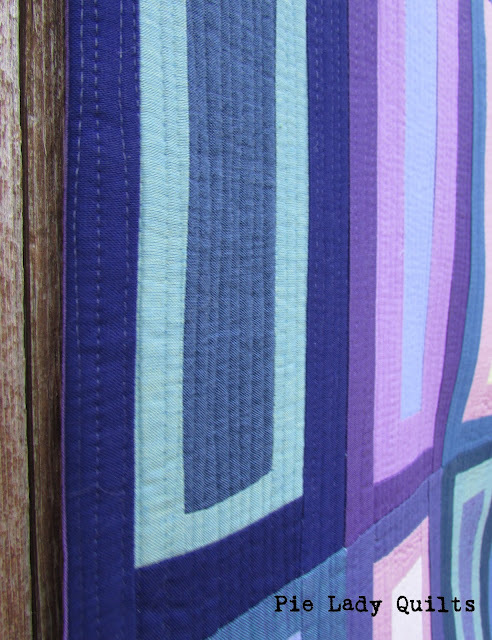 It is also quilted with monofilament thread. Since my last post, I have safely delivered a baby girl (the big kids call her "Babyness"). There were some bumps, but it all worked out in the end and we are both healthy and happy. She is the sweetest, most content little girl you could ever imagine and is greatly loved. Her favorite thing to do is play the smiling game. Whenever she initiates the game with her older siblings, they'll bellow "She's passing out smiles like candy!!" and everyone else will come running to smile and coo at her. It warmed my heart to see her start the smiling game with some other children in the pew ahead of us at church. I'm glad that everyone in her little world smiles back. That's exactly how it should be. These quilts were fun to make and a great creative outlet. 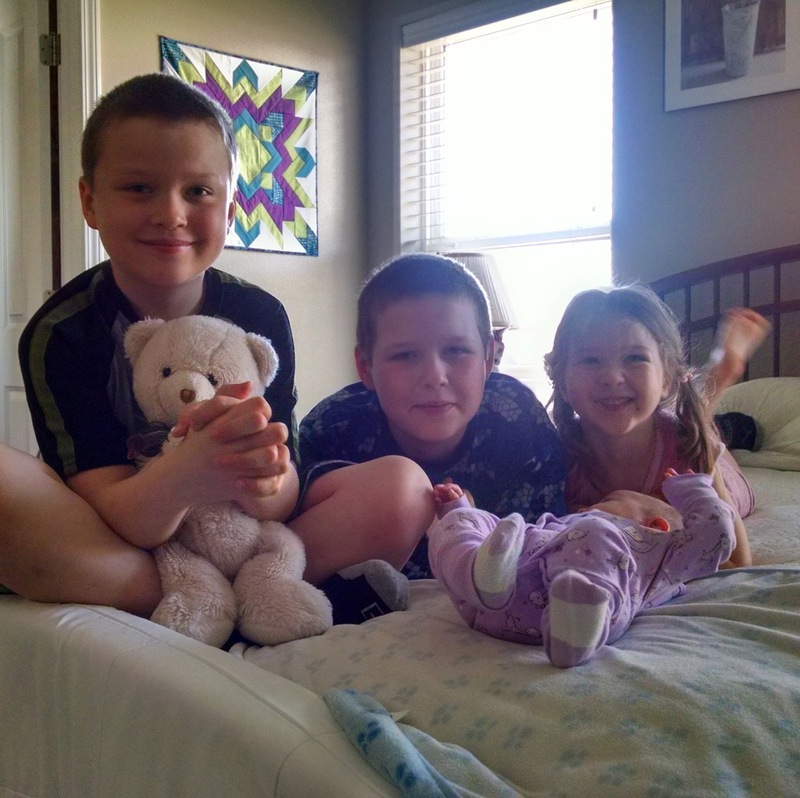 But, make no mistake, these smiling kids are my greatest treasure. 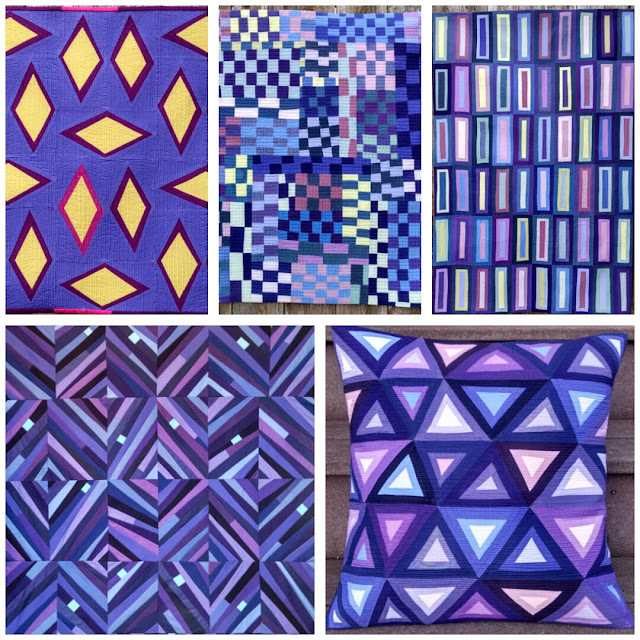 If you'd like to take a look at the collection of quilts created with Pantone Ultraviolet, you can find them at No Hats in the House or Bryan House Quilts.